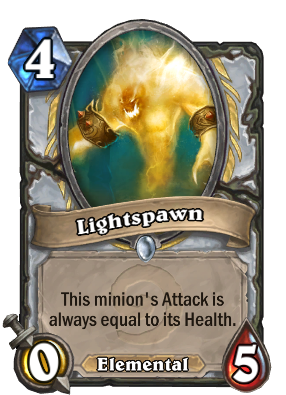 In the next expansion, Lightspawn is confirmed to be an Elemental. Important for future evaluation of this card. It's a card that got buffed and is still bad. You gotta try to be this ineffective. Just did this on turn 5. Actually was Power Word: Shield > Divine Spirit x = 28 damage. Had already done 1 and then 1 damage minion = 30 total. Was hilarious.